2019 Update 3: What Schedule? We’re NOT the furthest behind we’ve ever been, but we’re definitely not on a “happy pace”. We’ve made a LOT of prototypes this year. A wide variety of different stuff, with very few of them getting “refined” in any significant way. Instead we have many shallow” prototypes that teach us something quickly before being thrown onto the shelf as the team moves onto something newer. We’ve got a plan for the robot… actually we’ve got lots of plans. In 2013, 2014, 2015, and 2017 we were within a week of the first “everything’s done” production release. Do I feel like we’re a week away from a big release? No. I do not feel this way. In 2018, we could have released everything by this point, but paused and decided to spend more time tuning the details of the elevator design. We released the drivetrain (and got the metal back! ), but held off on the elevator for another half a week. Do I feel like we’re a half-week from being done with this year’s lift mechanism? HA! No. 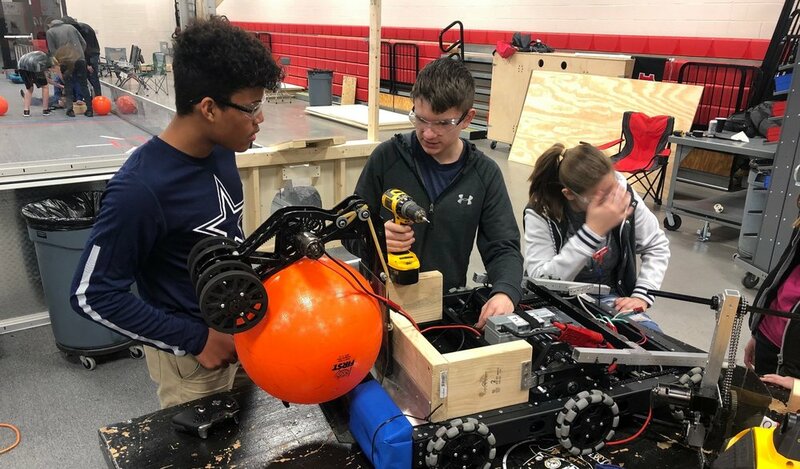 The 2019 @robowranglers Drivetrain Prototype is about to begin testing. I’m feeling optimistic! One of the GREAT things about doing the Build Blog in 2018 is that we now have a detailed account of where we were in the process on specific days! Saturday January 20th, 2019 was “Day 16” of the Build Season. Where were we on Day 16 last year? Tuesday January 22nd, 2019 was '“Day 18” of the Build Season. Where were we on Day 18 last year? Saturday January 26th, 2019 is “Day 22” of the Build Season. <JVN weeps, silently> Where were we on Day 22 last year? This year’s build season doesn’t feel like 2018. This year feels more like the 2016 schedule… In 2016 we didn’t do our big production drop until late in Week 5. We had lots of initial prototypes, and then had a “high fidelity” prototype designed specifically for iteration. This prototype went through lots of scoring tests, and lots of tweaking and tuning. Ugly… but: It could cross defenses, vision track, and autonomously score a ball. (If you hand-loaded one). #DoesItComeInBlack? Is that how this season is going? Right now, we’ve completed a lot of prototypes. We’ve got two drive bases with prototypes on top driving around scoring. Both of the mechanisms on these robots have gone through multiple “wildly different” iterations. We’ve been doing strategy analysis and time-trials for a few weeks. We feel good about our plans for object acquisition. We feel good about our plans for object scoring. Uppercut ran a “good” auton in 14.5 seconds. I never freak out about the schedule. Most of the other Robowranglers don’t even ask me how we’re doing. We’ve all learned - Trust the Process. Even though I know we’ll recover fine. Even though we have all that wonderful progress I described above: what makes me feel like we’re a bit behind this year? Well, there’s been a holdup. It is a holdup that happens almost every year. This year - it started sooner, and this year - it is lasting longer. That’s been the delay. We’re waiting on the design team. In this case, not because of detail work delayed, but because we’ve been struggling with system integration. We’ve been working on it since Week 1, and we’ve been struggling all along. We have lots of great pieces, but we’re unable to fit them together in a way that makes us happy. We are struggling with Limit vs. Wants… Maybe we’ve painted ourself into a corner. Maybe we want too many things. Maybe we have too many constraints on the design - maybe some of them aren’t important? This has gone on for… a while. I’ve got a folder full of CAD screenshots, and a pile of coffee stained sketches on my desk. This is another on the pile of failures. The good news is - as of January 25th, we didn’t really make any additional changes. We’re finally pushing beyond the basics! At Saturday’s meeting, our goal is to build up “high fidelity” prototypes of the major systems for testing while we continue the detailed design. This robot excites me. There are lots of “cute” design features which warm my soul. And… our current plan for the end-game has me giggling every time I think about it. BONUS: Curious how the Robowranglers organize our team during the build season? Want to know more about our prototyping methods? I posted my response to someone similarly curious! Might be useful in this game? JVN: Do we even need chain in the drivetrain? What if we just do linkages connecting the wheels? JVN: We could have a choo-choo train as our drivetrain! Chooo chooooooo! 148 Mentor: I mean, a chain is just a bunch of linkages put together. JVN: This end-game concept is totally going to work. Art Dutra: It’s NOT going to work. JVN: Well, I say it IS going to work. Art: PHYSICS says it won’t! JVN: We are engineers, physics does what we tell it to do! JVN: You have no idea. I want it SOOO badly. This idea makes me giggle. This can be my birthday gift AND Christmas present all rolled into one! Pleeeeeease try it. Just try it… I KNOW it will work. The Robowrangler Design Process is a lot of conversations like the 2 listed above. This is Fine.